Having a flatter, toned stomach can seem unattainable if you’re skin is stretched after losing weight. Even exercise and dieting aren’t enough to produce visible changes. That’s why many women and men choose to undergo abdominoplasty, usually called a tummy tuck, at our practice outside St. Louis. Tummy tuck surgery can restore confidence in your body after having children, or losing a significant amount of weight. 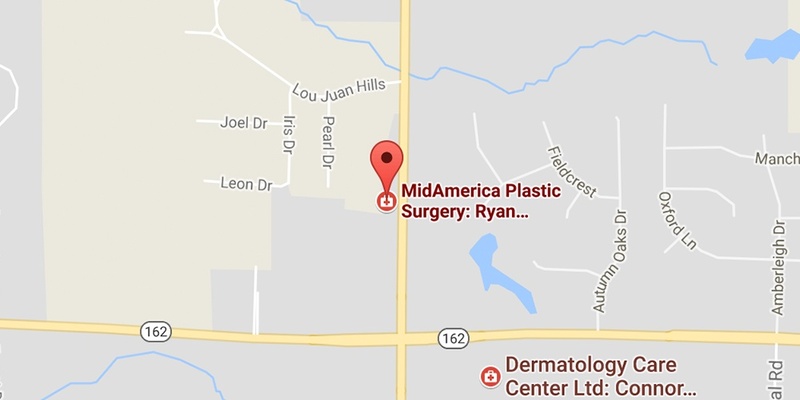 At MidAmerica Plastic Surgery, Dr. Ryan Diederich is a board-certified plastic surgeon who combines experience and advanced training with a friendly personality to create a positive experience for patients. Southern Illinois residents considering tummy tuck surgery find our Maryville location more convenient than driving into St. Louis for the procedure. We invite you to request a consultation with Dr. Diederich, or give us a call at (618) 288-7855 to schedule an appointment. A $100 consultation fee will be collected to reserve your appointment. A tummy tuck (or abdominoplasty) surgically removes excess fat and skin from the abdomen and tightens abdominal muscles that may have separated during pregnancy. This can create an abdominal profile that is smoother and firmer. Tummy tuck results can vary considerably depending on a variety of factors, including your age, height, and weight. Below we have included several image galleries of MidAmerica Plastic Surgery tummy tuck patients that show before and after photos of their results. Who may benefit from a tummy tuck? After pregnancy (See Mommy Makeover). After weight gain or loss, whether it be through diet and exercise or procedures such as gastric bypass or gastric banding. As a result of aging. Panniculectomy: Although not a tummy tuck in the true sense, this procedure is developed primarily to remove the overlying skin that has resulted in recurrent infections. This is a function procedure and sometimes covered by insurance. The goal is functional, not cosmetic. Mini Abdominoplasty: This procedure is for those with a minimal laxity of the abdomen. It only addresses some of the laxity below the belly button. Full Abdominoplasty: Perhaps the most common procedure and often the procedure of choice after pregnancy. All skin and stretch marks below the belly button are removed, the rectus muscles (6 pack muscles) are re-approximated in the middle if they have separated, and we remove as much tissue as possible. Fleur-de-Lis Abdominoplasty: This is a type of tummy tuck that leaves a vertical scar. Because a vertical scar is created we are able to tighten both in the vertical direction but also side to side. This procedure is used primarily if you already have a vertical scar or sometimes in massive weight loss patients. How is Dr. Diederich’s technique different from many others? Dr. Diederich works hard to provide the latest techniques and innovations which has led him to the progressive tension abdominoplasty. A progressive tension abdominoplasty utilizes suture techniques to limit the tension in any one location of an abdominoplasty while closing any space that has the potential for fluid accumulation. Dr. Diederich has refined this technique using rows of progressive tension to evenly distribute the tension across the abdomen. The results? Tighter, flatter tummies than ever before with a statistically significant decreased rate of hematoma, seroma, wound breakdown, and complications! Can I combine this with abdominal liposuction? Some abdominal liposuction can be completed at the same time, however, only in certain areas. It is safe to do liposuction in other body areas at the same time. Tummy tucks are not a substitute for weight loss through diet, exercise, or surgical means. Thanks to progressive tension abdominoplasty, Dr. Diederich rarely uses drains with this tummy tuck technique. Pick up your prescriptions so they are ready on surgery day. Recovery varies from patient to patient and depends on the extent of the procedure, your overall health, and other factors. Pregnancy, weight loss and menopause may influence the appearance of your body over the course of your lifetime.